On this trip we are taking our daughter Siân and her husband Mubarak with us. Siân wants to show M, who has never been to France before, some of the places she has enjoyed on previous visits. They will leave us in Bordeaux, from where Pat and I will travel south to Biarittz where we will meet our other daughter - Rachel. How far home can we get through Spain and France before we breakdown? On Friday 8th August Siân, M, Pat and I leave home for Dover. We are booked on the "Cezanne" the 00:45 Dover to Calais ferry. We had told Mubarak about the great new ferries on the Channel crossing and then found we were on Sea France’s smallest and oldest rust bucket. Although a little disappointed we had an uneventful crossing and upon arrival parked up at the ferry port and slept for the night. The next morning we visited St Omer and then at teatime drove onto Buysscheure and Camping La Chaumiere, where we spend the rest of the evening and the following day relaxing and doing very little. On Monday we drove from Buysscheure to Maisons-Laffitte, west of Paris. We have used the Campsite International here many times when visiting Paris. We walked into “town” for Siân to show M around. The next two days and evenings were spent in Paris doing the whole “tourist bit” showing M as many of the sites as we could fit in. At the observation platform up the Eiffel Tower we even managed to find the direction and distance marker for Muscat, the capital of Oman, where M comes from. Thursday 14th August saw us move from Maisons-Laffitte to Poitiers via Chartres, Chateaudun, Tours and Chatellerault. 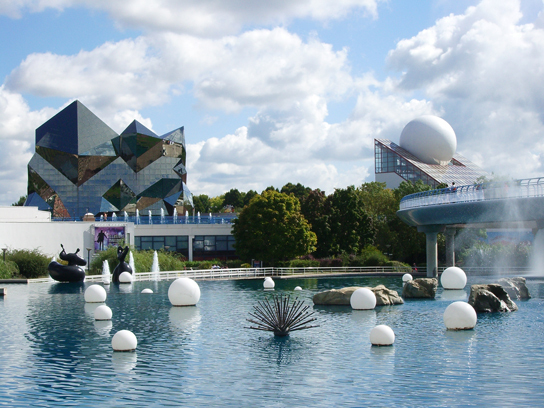 Here we stayed at Camping du Futur, 4 miles from Futuroscope , the theme park dedicated to the moving image, at which we spent the whole of the next day. There were many new “attractions” since our last visit. On Saturday we moved to the Île de Ré via La Rochelle, where we camped at the municipal site at St Martin de Ré. This was but a short walk from the centre of town and the harbour, a great base from which to explore for the next day and a half. It is a beautiful island with a dark history, being the embarkation point for prisoners bound for Devil’s Island. Today it is very crowded in August. We left St Martin en Re travelling a few miles to the municipal site at Lagord, on Monday 18th. From here we visited La Rochelle. Though the itinerary for this trip was chosen by Siân and we have visited all the places before, we like them all, indeed La Rochelle is one of our favourite holiday destinations. Saintes was our destination on Wednesday 20th. We travelled via Fouras and Rochefort to give M the opportunity to visit these beautiful towns. Having explored a city which dates back to Roman times we next went to Arthenac, south of Cognac, via Cognac and Archaic. We stayed at a vineyard, La Barde Fagnouse (Cognac Chainier & Fils) – this was made possible by the France Passion organisation, the membership of which came thanks to Carl’s Mum, a great Christmas present! Thanks Mum. On Friday 22nd we moved to Gradignan, in the suburbs south west of Bordeaux, where we returned to Camping Beausoleil. From here we visited Bordeaux, a first for Siân as well as M. Both loved this beautiful city. It was from the airport at Bordeaux that on Sunday 24th August Siân and M flew back home to England. Carl and Pat paid another visit to Bordeaux and then went back to catch up on domestics! The next few days would see us staying on overnight parking areas reseved for motorhomes called Aire de Camping Car. So it was the first morning saw us move a few miles SE of Bordeaux to the "French Bastide" (new town - 100 years war) of Cadillac, after which the car was named. After one night here we travelled on to le Reole. Before arriving at le Reole, another fortified town, we called at St Macaire, a Medieval gem. Le Reole has one of the oldest Hotel de Ville (town hall) in France, it was given to this "English town" by Richard the Lionheart. This was the hottest day so far 30°C+. The following day we walked around le Reole to see the Benedictine Priory and the old town and then moved to Frontenac a few more miles SE. Here we stayed at a lovely Aire de Service, in centre of village, its a great base to visit more medieval villages – Monsegur (English Bastide), Castelmoron-d'Albret (smallest village in France), Sauveterre-de-Guyenne (French Bastide). We spent Thursday 28th quietly in and around Frontenac. Friday 29th August saw us move from Frontenac to the Bassin D'Arcachon and on to the Dune du Pilat (the highest in Europe). Here we stayed overnight at the Aire. The following day saw us move a few miles to Biscarrosse Lac via Biscarrosse Plage, where we spent the night at the Aire at the Marina. We moved again the next day to Dax, France's No 1 thermal spa town, which is also famous for rugby and bull fighting. We travelled via and visited Levignacq, a village which typifies the old villages of the "Landes Region". On the way we saw many old motorbikes whose riders were on a vintage bike rally. Monday 1st September is a “Red Letter Day” for Pat – she is now officially retired. To celebrate we moved to Labenne Ocean and Camping Sylvarmar – a 5* campsite with great facilities including a fantastic swimming pool complex. We are going to stay here for a day or two as our other daughter, Rachel is flying out to join us. We drove around the area, including Biarritz and then on to it’s airport to check out the parking (always a worry with a motorhome) ready to pick up Rachel tomorrow . Wednesday 3rd September - Rachel arrives at Biarritz airport where we manage to pick her up and then drive back to the camp for a swim, a Paella and the evening rounded off in the bar. The following day we drove into Biarritz, which we explored. We ate a great meal near Market No 8. Whilst eating lunch the weather turned wet so we hit the shops. On Friday we crossed the border into Spain and set up camp at Zarautz. This is a great town, with a fine beach. Here we had a super meal before going back up the hill to admire the magnificent views from the campsite. On the Saturday we went to Donistia / San Sebastian. This is a very classy resort, which we enjoyed exploring, though it was extremely crowded as the annual Cider Festival was in full swing. The weather in the morning was overcast and damp though this did not seem to spoil the festivities. At lunchtime we managed to find a small family run restaurant, in what was obviously their apartment in the old town where we had a wonderful “Basque meal”. In the afternoon the sun came out showing the magnificent bay and its islands off to best effect. On the Sunday we visited Bilbao to wander around the city and visit the fantastic Guggenheim Museum. The Monday saw us relaxing around the campsite at Zarautz. Now refreshed we left Zarautz, recrossed into France heading back to Bordeaux and Camping Beausoleil, where we spent another quiet day relaxing as it was very hot 30°C+. As Rachel had not visited Bordeaux and was anxious to do so it was here that we headed on the Thursday. On Friday 12th we visited the Fiat agent in Bordeaux to try to resolve the alternator problem which started on the way from Spain. They were unable to help, so we set off for Caen and the ferry. We got just north of Nantes before finally coming to a halt. From where we were rescued by RAC France and put up in the Ibis Hotel near Nantes . The following day our motorhome was repaired by a wonderful small garage (on a Saturday too) and then we travelled to Ouistreham ready to travel on Sunday 14th on Brittany Ferries' Caen-Portsmouth ferry. We took Rachel back to Bristol, staying overnight before travelling home on Monday 15th to do the washing, check the bank balance and plan our next trip! !